Moss Landing, CA is located about15 miles north-northeast of Monterey, CA (about 1.5 hours by car from the East Bay, where we live), on the shore of Monterey Bay. Located in Moss Landing is the Moss Landing Marine Laboratories, a multi-campus research facility of the California State University, and also the Moss Landing Power Plant, a natural gas plant that is visible from Santa Cruz, California to the north and Monterey, California to the south on clear days. Moss Landing is also a big tourist attractioin, as it is the spot where many what watching tours leave from. We finally took one of these tours, from Blue Water Whale Watching, in late September 2014. The tour was 4 hours long and had a money-back guarantee that we would see some whales. There was no dearth of whales, that's for sure. Moss Landing is one of the few places in the world where you can see whales year round, although which ones you are likely to see changes with the season. I would recommend it except 4 hours is perhaps too long, especially if you're prone to sea-sickness. Seals in the water. 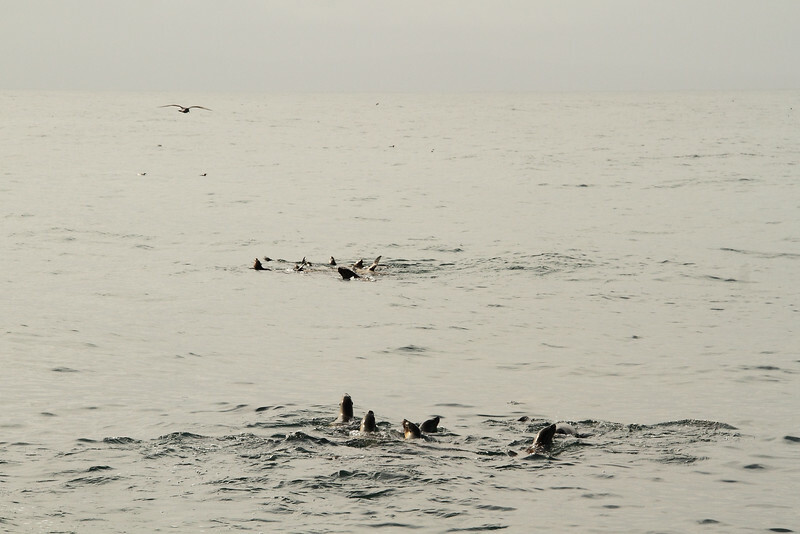 How you recognize that there will be a whale is by the big pass of seals you see together in the water like this. It means a whale is underneath and will surface soon.